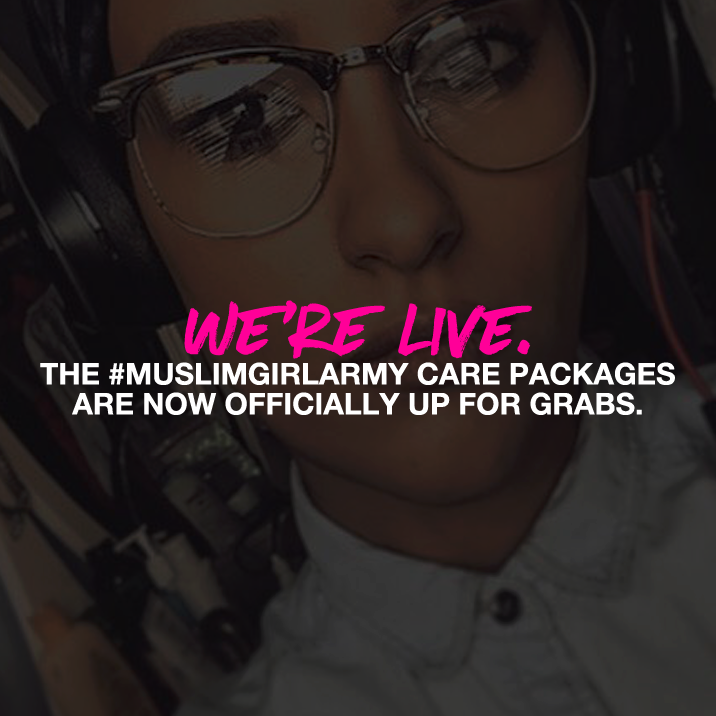 The #MuslimGirlArmy Care Packages Are LIVE! Black Friday has arrived and so has the moment we’ve all been waiting for: #MuslimGirlArmy Care Packages! The first of our monthly subscription boxes went live this morning. The first 25 free signed copies of Muslim Girl: A Coming of Age by Amani Al-Khatahtbeh have already been claimed. But, you can still get your hands on the debut holiday box that has been raved about in Fortune, Refinery29, and Teen Vogue before it’s gone! This is the first subscription box service that caters to the lifestyle of a Muslim woman, with every month offering a new “care package theme”. This first, Post-Election Care Package, includes pepper spray (US orders only), our Crisis Safety Manual for Muslim Women and a handwritten letter from our Baddie of the Month. Sponsored by the Dubai-based Miella Fashion, it is also packed with everything you need to treat yo’ self. It features both your favorite name brands and small Muslim businesses. Every month’s care package will include a scarf that can be worn as either a hijab or accessory and the one you order today will feature the halal Canadian cosmetics company, Tuesday in Love. Of course, this is only a few of the products included in the Post-Election Care Package; there are many more surprises where these came from. To learn more about the #MuslimGirlArmy Care Package, click here. The debut holiday box is in limited supply, so act fast! *Edit: The first 25 boxes have already been ordered.